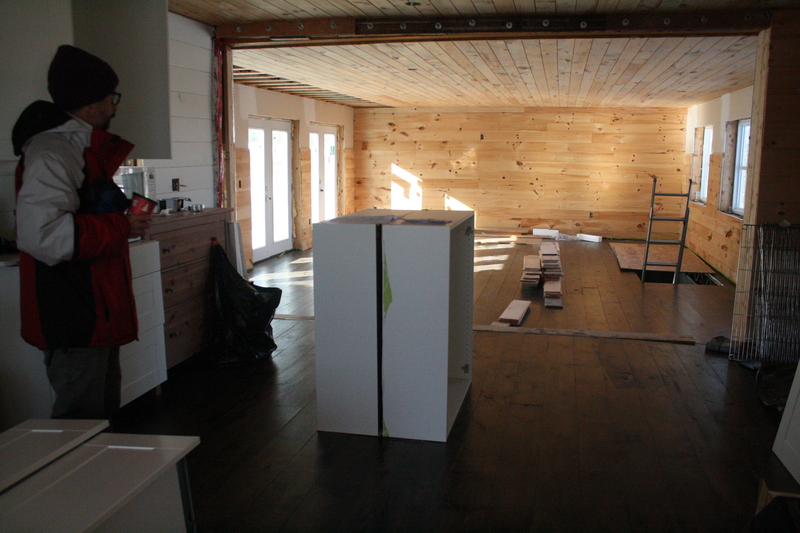 When we first walked through the house, I was glad to see they had already ordered the cabinets, assembled them, and had them roughly in place. This gave us a good idea for where things were supposed to go, as far as appliances, etc. There was no sink, but on our second visit I found the sink in a box in the other room. It is this DOMSJÖ porcelain apron sink from IKEA. By then we had pretty much decided to buy the house, so I was super excited. My Pinterest board for kitchens is covered with images of apron sinks in country farmhouse kitchens. As my mom would say, this was A Sign. 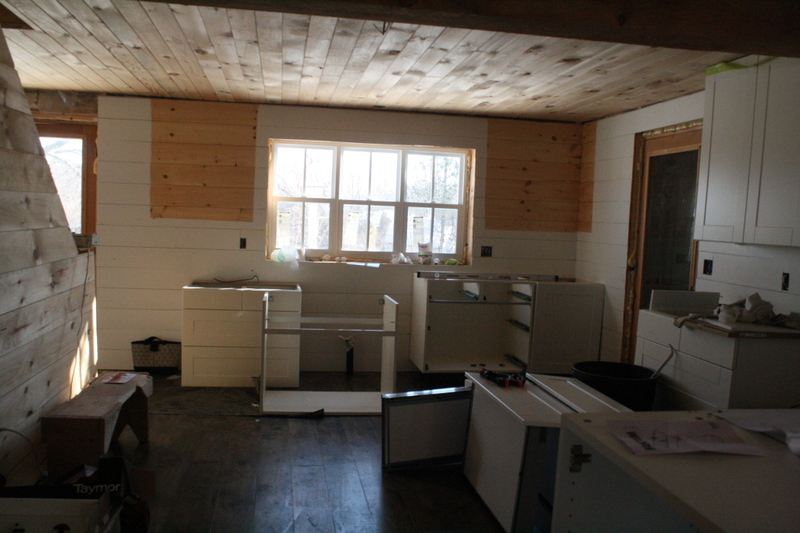 Once we visited the house a few times, and started thinking and planning the kitchen, we had a good look at how the cabinets were installed. Or rather how they weren’t. While the upper cabinets were anchored to the walls, the bottoms ones were not. We also realized the layout of the cabinet pieces by the sink were… less than symmetrical. As you can see, there was a drawer cabinet, the sink cabinet, a cupboard with a door, then another drawer cabinet. Once we noticed it bothered the crap out of both of us. So we moved them around. We also took down the upper cabinets with a thought of using them maybe elsewhere. It really opened up that wall, and the best part was, when you come in the front door you’re not greeted in the face by the side of a cabinet. Some open shelving will go here instead – nice and white painted wood with some solid white wood curved brackets. We also made sure that the sink cabinet will be centred under the window. The island in the kitchen, we also planned out using the upper cabinets, just as placeholders. This helped us decide exactly how far away from the other cabinets it should be, how long and where exactly the dishwasher goes. There is a pipe coming up in the floor already for the dishwasher, so that’s what we worked around. And a good thing, too, because the next Monday IKEA had a free shipping sale that day only. We ordered exactly the matching cabinets we needed, and the extra legs we also discovered we needed. On another day, Ron also went back and levelled the base cabinets next to the sink and anchored them to the wall. He even started cutting the holes in the sink cabinet for the drain pipes, since they come up from the floor. While we had our daughter Sarah there today, we showed her what we had done and then had an idea about the fridge placement as well. It’s still along the same wall, except we’re going to try it in the pantry alcove instead of the wall near the door. So we do have progress, it’s just slow. We have loads of time.